The number of publications dealing with video game studies has exploded over the course of the last decade, but the field has produced few comprehensive reference works. 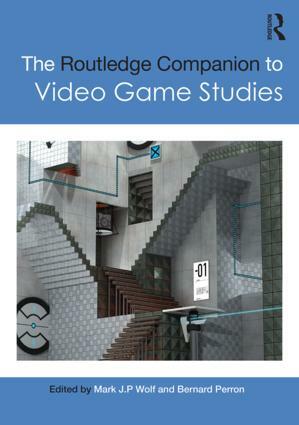 The Routledge Companion to Video Game Studies, compiled by well-known video game scholars Mark J. P. Wolf and Bernard Perron, aims to address the ongoing theoretical and methodological development of game studies, providing students, scholars, and game designers with a definitive look at contemporary video game studies. accounts of the political, social, and cultural dynamics of video games. Each essay provides a lively and succinct summary of its target area, quickly bringing the reader up-to-date on the pertinent issues surrounding each aspect of the field, including references for further reading. Together, they provide an overview of the present state of game studies that will undoubtedly prove invaluable to student, scholar, and designer alike. Mark J. P. Wolf is a Full Professor and Department Chair in the Communication Department at Concordia University, Wisconsin. His books include Abstracting Reality, The Medium of the Video Game, Virtual Morality, The Video Game Theory Reader, The Video Game Explosion, The Video Game Theory Reader 2, Myst and Riven: The World of the D'ni, Before the Crash, The Encyclopedia of Video Games, Building Imaginary Worlds, and Video Games Around the World. With Bernard Perron, he is the co-editor of the Landmark Video Game book series. Bernard Perron is a Full Professor of Cinema at the University of Montreal. His books include The Video Game Theory Reader, The Video Game Theory Reader 2, Horror Video Games, Silent Hill: The Terror Engine, Figures de Violence, Z pour Zombies, and The Archives: Post-Cinema and Video Game Between Memory and the Image of the Present. With Mark J. P. Wolf, he is the co-editor of Landmark Video Game book series.